It's been quite a while since I shared a wishlist post on my blog, so I thought it was time for me to change that and show you a few of the beauty items which are currently on my wishlist. The item that is at the very top of my beauty wishlist is the L'Oreal Paris Volume Million Lashes Waterproof Mascara, a mascara which claims to give the lashes volume without overloading them or making them look clumpy. Despite having been on the beauty stands for quite a while now I've never tried this product, as my current mascara is beginning to run out I may look at buying this as my new everyday mascara. 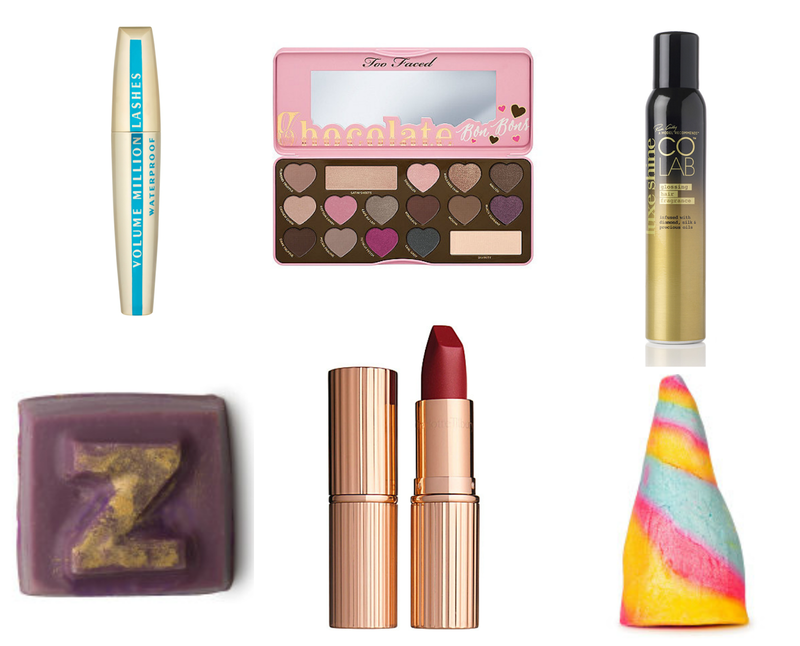 Whilst browsing though the Debenhams beauty section I stumbled across the Too Faced Chocolate Bon Bons Eyeshadow Palette which immediately caught my eye. If I'm honest the packaging doesn't really appeal to me, but the shades contained within the palette definitely do. With a mix of both matte and shimmer eyeshadows in 16 different shades this definitely seems like it'd be right up my street. COLAB Luxe Shine Glossing Hair Fragrance is one of the more recent releases from the COLAB hair range and one which I think sounds intriguing. I've tried most of the other products from the COLAB range and been pretty impressed so I'd like to treat myself to this at some point to see how it compares. Of course there is a couple of LUSH products currently on my beauty wishlist. The products I currently have my eye on are Dreamtime,a bath oil which sounds like it would be the perfect addition to any end of the week pamper night, and the Unicorn Horn Bubble Bar which is a returning limited edition product from the LUSH Valentine's range. The final product on my wishlist is the Charlotte Tilbury Matte Revolution Lipstick in 'Love Liberty'. Since the Charlotte Tilbury range hit Selfridges there's been so much hype in the 'blogosphere'. I've never tried any Charlotte Tilbury products but at some point this year I'd like to splurge and treat myself to one of the lipsticks and 'Love Liberty' looks like my kind of shade. I'd love to know what beauty products are currently on your wishlist? Have you tried or reviewed any of the products I've mentioned in this post? I'd love to know your thoughts.